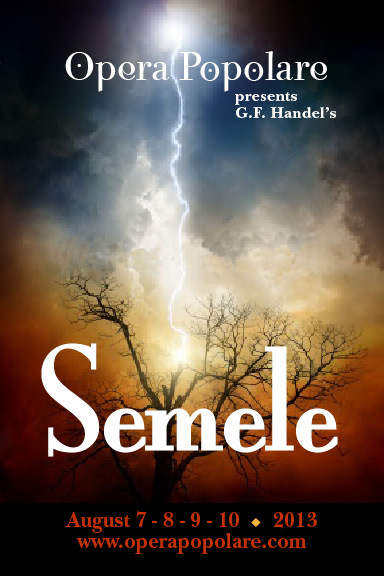 Semele, by G.F. Handel, August 7, 8, 9, & 10 2013 at the Garden Street United Methodist Church, 1326 North Garden Street, Bellingham, WA. August 7, 8, and 9 (Wednesday, Thursday, and Friday at 7:30; August 10 (Saturday) at 2:00. The production will be suitable for families with school age children, in length, content, and price. The venue offers excellent acoustics, padded seats, and excellent visibility (raked floor) on 2 levels. Tickets $12.00 online at www.operapopolare, the Community Food Coops on Forest St and at Cordata, at Piper Music, and at the door. The Opera is based on the Classic Roman myth of a mortal who wants to become a goddess. As in other operas, vanity, jealousy, and intrigue motivate the action. Local singers include Serena Viens and Caitlin Hill sharing the roles of Semele and Iris; Carlo Furlan – Jupiter; Lesley Rigg – Ino; Celie Thomas – Juno; John Poppke – Somnus; Matthew Dunn – Cadmus, Chris Mitchell – Athamus. Opera Popolare Chorus includes Wanda Maddox, Karen Powers, Andie Whitewing, Sue Rivord, Tricia Sikes, Dorothy ChildsWeber, Jana Koshinz, Anna Joy Walker, Tim LaRiviere, Brian Myrick, Hunter Dunn. Instrumental Ensemble includes Laura Barnes – Violin 1; Jeannette Wickell – Violin 2; Jane Perkins – Viola; Adrienne Syvertson – Cello; Calyx Hoag – Oboe 1; Kathlyn Kinney – Oboe 2; Katie O’Rourke – keyboard. Chorus and orchestra are directed by Rob Viens, who directs the stage action as well. Lori Childs is costume mistress.